Trained as a journalist and a grant writer, over the last seven years, I assumed a quasi-methodical way of addressing description in my fictional writing. As a mode of discourse, description does not come naturally to me. I view my stories as they play in my head (much like a screenplay or a theatrical performance), and it would be easy for me to ignore the fact that my reader does not see what I do. Needless to say, it is my responsibility to assure that he does. Many writers saturate their pieces with long descriptive passages, while others provide only bare bone details. Discovering a balance is the answer. Permitting the reader to see, hear, smell, taste, and touch what the author does is a testimony to the senses. The point is to create an image that closely mirrors an observer’s experience. Description should provide the same information that the reader might get directly if he was involved in the situation. • As the reader’s eyes, the writer must thoroughly describe what he sees. The relationship of items to one another. The light. The shadows. The distance. The texture. All of it must be described. • As the reader’s ears, the writer must tend to the sounds. Loudness. Staccato. Rhythmic pattern. • As the reader’s other senses, the writer must assure that he describes every detail. Feelings. Touch. Taste. Smell. Kinesthetic-Tactile experiences. • As the reader’s conscious, the writer will enforce the mood he wishes to convey. Each detail layers the tone created. A mystery writer describing a deserted building will choose different details from that of an architectural slant. Choose the details, which reinforce the mood. Yet, for description not to drown the narration, the writer must first keep the intended audience ever present in his mind. What must one absolutely know about the subject or the place? What may one omit? Each descriptive passage should convey one dominant impression. Details must be carefully selected. Avoid creating tediousness by including every discernible detail. A consistent point of view aids in the piece’s organization. Where is the writer when he describes the scene? The reader must be aware of where the writer places himself spatially. Order of location – presenting the details in a manner, which reflects their location in the scene – clarifies the nature of the details. 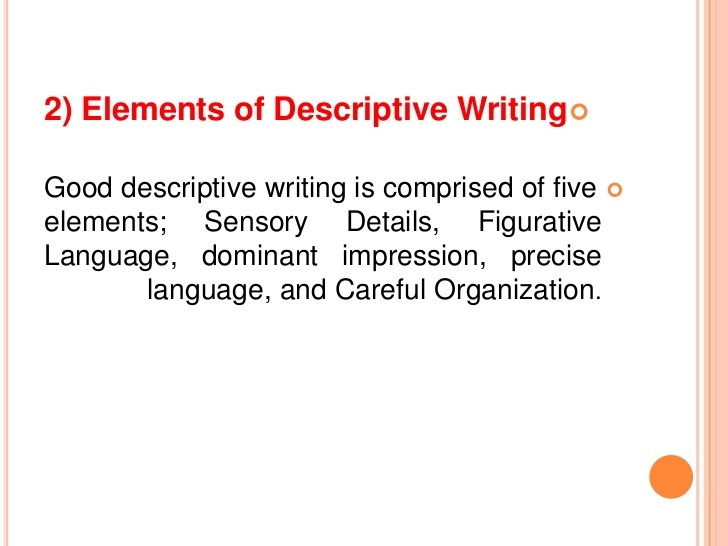 Good description depends on the writer’s ability to convey his observations. Begin by describing the whole scene briefly and then focus on one specific part. Remember to write unforgettable description, one must use vivid, reminiscent details. Use concrete sensory images and figurative language. Effective description conveys the experience exactly as one planned it. Use specific details, which are associated with actual items, and concrete language, which is coupled with the senses. Do not forget to cut the “deadwood,” especially vague words, such as handsome, tall, soft, etc., which offer multiple meanings/impressions. Also avoid the fancy (florid, ostentatious, embellished, lavish, etc.) choices. Use words that pin down the exact meaning. For example, using puissance instead of manliness serves no purpose if the reader must consult a dictionary to understand the passage. Impressionistic details are those, which an observer would see first? What would the observer see second? Third? And so forth? Present the details in the order in which someone would notice them. 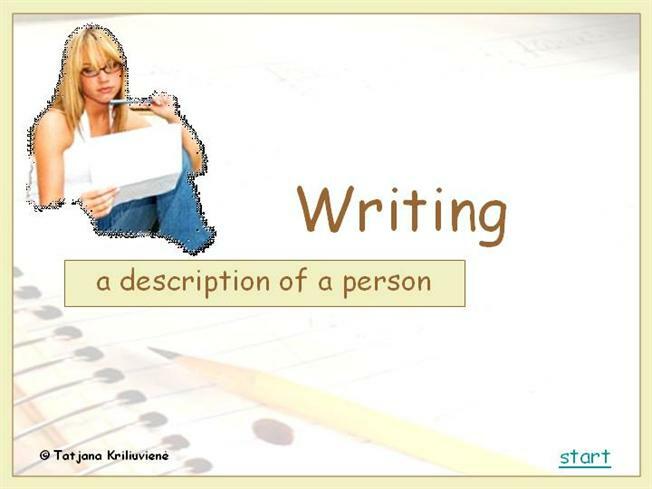 • Use “definition” when describing the unfamiliar. • Use division/analysis, separating a whole, singular subject into its elements – slicing it into parts. This helps the reader follow the detailed description. • Whether the previous two steps are necessary depends upon the familiarity the writer’s audience has with the subject. • Use concrete words to describe material, color, weights, sizes, distance, etc. • Limit the number of details to fit the purpose. • Observe contiguity in moving from part to part. • End with a brief description of the movements, behaviors, or habits of animate things. • Include uses for inanimate things. • Follow a thematic pattern by dividing the scene into mental categories, and regardless of their actual relationship to one another in space, describe elements that support one theme and then another theme, etc. Overall, good description gives concrete details in a strategic sequence, which creates the piece’s mood/tone. The reader should have a strong sense of the whole scene, but should also be able to invoke specific details effortlessly. This entry was posted in writing and tagged description, narration, sensory details, writing. Bookmark the permalink. This was great. It has been bookmarked so I can refer to it often! Thanks, Jessica. I am pleased you found it useful.